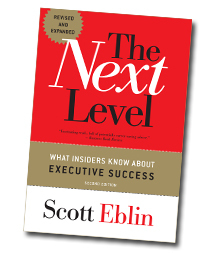 This week Peter speaks with Scott Eblin about his new leadership book, The Next Level and the challenges of stepping into a new leadership role. Plus Leadership in the News, Website of the Week, Pam’s Research Report of the Week and more great podsafe musicby Ingrid Michaelson. McKinsey Quarterly – phasing out Premium (paid subscription) all content to be free! Leadership advice: Listen more and talk less. Be an observer and ask good questions.